If you need shift how you are feeling in general, this interview with Dana Malstaff will for sure do the trick. 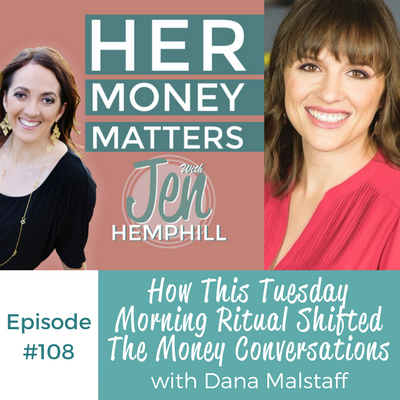 She’s got an energy about her that will make you smile AND she shares some incredible wisdom, plus the details behind her Tuesday morning money conversations! Why she feels money is not ever the goal to have but what it is instead. How she maximizes gift cards and gas points. What her Tuesday morning and Happy Hour Rituals are with her husband and the impact it has had on her. How understanding how your partner likes to feel valued makes it easier to talk money. Growing up, Dana’s father ran an auto body shop. So she saw from very early on what it was like to run a business, how different things like the economy and competition affect the the business, and create the ups and downs that comes along with it. She also learned how everything in our environment impacts the money we make, spend, and the value of our money. Her mom was a registered nurse for a long time. When her parents separated, she and her mom travelled a lot, and money was a vehicle for experiences. Money was never a thing that they held or hoarded, but rather a conduit for what they wanted. When her mom and now stepfather reconnected after being high school sweethearts, they were living in LA together. They decided to put names of states that they liked into a hat, and pulled one out – it was Virginia. So they decided to move from LA to Virginia. The money conversation that came out of that decision was “how to we get there?”. Living a more minimalist bohemian lifestyle in her younger years, money talk with her parents was always centered around living today to the fullest, and not about planning for the future. It was only later in life when she was married and had kids of her own that she began to think about the future. Dana is an all-in type of person. For her, it was not natural to think of a side hustle along with her full-time job to make extra money. She was either all in, or all out. Hence, in situations where she wanted to take a vacation for example, and did not have the funds to do so, she felt stuck and powerless in her job because she could not make more money. She quickly realized that if she wanted the power to make more money, she had to be an entrepreneur. Because Dana can only focus on one true life priority at a time, and she knew this to be true of herself, this model worked much better for her versus a corporate 9-5. The best money advice Dana ever received is that money is not the goal, it is the outcome. Money is just a form of bartering – a way that we created to unite us in the understanding of the value of something. It is one way to get the things we want. Dana shared how the economy is just a continual exchange. There would be no economy if there was no spending of money. Making her money work for her and is very good at stretching the value of a dollar. For her, a dollar doesn’t equal a dollar, it can be worth much more. She gives the example of how she and her husband use credit cards to buy gift cards for the stores that they shop at, getting the points on the credit card and travel miles. For Dana, money spent on experiences and memories that have expanded her as a person are the best monies she has ever spent. On a monthly basis, Dana and her husband, who is a banker, meet every Tuesday morning and they sit down and review her business finances and how they pertain to their personal finances. Prior to doing this, money conversations were more confrontational with Dana feeling like she had to defend herself and her spending. With her husband now in the know about her business activities, conversations are much easier. Once a month they also do a happy hour where they go out and talk about different things such as how they are doing with finances, where they might go for vacation and the like. They have a joint account that shared expenses come out, and they also each have a personal account. Every month, a certain amount of excess funds is split evenly between them, and put into their respective personal accounts and they can do whatever they want with that money, no questions asked. Before they had children they would each get $400 per month. They also have a $100 rule – if a necessary expense is higher than $100 they discuss it before spending. Dana feels very strongly that money talk is necessary. Money becomes a painful, raw word when we don’t talk about it. The first time she hit 6 figures was her best money memory. Dana’s stepfather who is extremely financially savvy, is a writer and an entrepreneur, taught her not to give money power. There is always a way to make money. She sees money everywhere, and even though most of it isn’t hers, there is never a lack mentality. And this positive mindset makes losing money easier. She quotes Grant Cardone: “Who has got my money?” Money is there to be had. I want to hear from you! What was your favorite takeaway from this episode? Please come on over to our community and share with us there.